Minuma tambo is an extensive green space located 20~30 km from the center of Tokyo. It covers a vast area of some1, 260 ha which represents a precious green space on the outskirts of the capital. Although it is only 2~3km from major railway stations, such as Saitama-shintoshin Sta. and Omiya Sta., there still remain rice fields, vegetable farms, copses, rivers and the Minuma-daiyosuiro (substitute agricultural irrigation channels) creating a rural landscape, and a rich natural environment which nurtures various forms of life. Another characteristic of this area is its long history in which unique cultures and traditions have been handed down for generations. 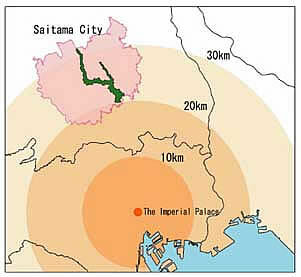 In the beginning of the Edo (TOKUGAWA) era (1600~1868), the Minuma tambo area, once a marsh, was developed by building a dam in the Shibakawa River and used as a reservoir for irrigation. Then, in the mid Edo era, in 1728 (Kyoho 13), the construction director IZAWA Yasobe Tamenaga carried out the order of the 8th Shogun, TOKUGAWA Yoshimune, to reclaim the land and develop a new rice field. 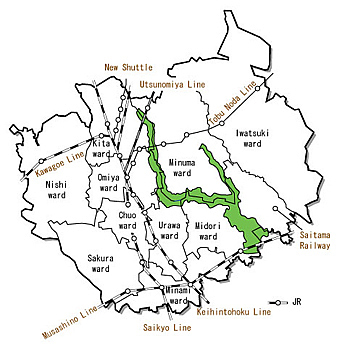 The Minuma-daiyosuiro (substitute agricultural irrigation channels) - nishiberi (the west channel) and the higashiberi (the east channel) - were constructed, taking water from the Tonegawa River, to create a large paddy field. Today, nearly 41% of Minuma tambo remains as a farm, but the size of the paddy fields has decreased to an estimated 6%. Clusters of paddy fields in three areas (in Kataya, Miyama, and Kami-yamaguchi-shinden) still remain which, together with sloped copses and the Minuma-daiyosuiro, form a landscape unique to Munuma tambo. The farms that occupy the majority of the Minuma tambo area produce taros, wheat, vegetables, garden plants, flowers, and ornamental plants. Minuma tambo is a fascinating place on the outskirts of the capital which is loved by many people for its beautiful landscape and long history. Facing a new stage in the age of “symbiosis of people and nature” and "coexistence of urban area and nature,” it is our mission to protect and cherish this green space as a priceless environmental asset for citizens and hand it down to future generations. Copyright © SAITAMA CITY ALL RIGHTS RESERVED.